In my years of investing, I have never have to commit to paying to a monthly investment into a financial assets. From what I learn about my peers, the active individual stock investors do not do that. The investors investing via exchange traded funds in a passive manner also do not do that. I do sense that there is a deep culture to commit to an automatic investment scheme. I am not saying these are poor way to build wealth. However, you can tell a lot by the way people ask questions. For some you know they have read adequately and are seeking our views to clarify certain doubts that they could not make sense of. For most people that asked the questions, it is as if they heard about the product vaguely, know about the product on the surface and are ready to take the plunge to invest. And that is a horrendous thought. I think you can take some time to be ready to commit your money to invest. And in truth, don’t keep getting suckered by the idea that “your money is earning near zero interest by sitting in the bank”. That is only a reality if you do not commit to building wealth. The reality is that whether you don’t invest today or invest today may matter less to your goal of financial independence or financial security. And today we are going to explain why it matters less, but you still need to learn to invest. Most of all, control your urge to start investing all your money immediately. When I was at the early stage of my wealth building, I was pretty blown away by the new stuff that I read on money. These include the power of compounding. How taking control of your finances can steer you to a much better situation. How investing is not as daunting as I thought and not as risky as well. These were not wrong lessons, but they big up the idea in your head that investing is so important that it should be prioritize over other things. That is where you might incur a lot of opportunity cost if you plunge head first into the world of investing. 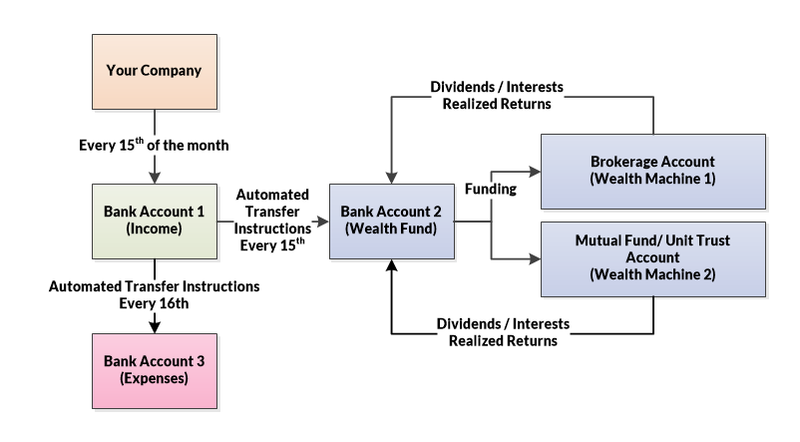 Zack from Four Pillar Freedom tweeted out this illustration that explains the impact of higher investment returns so well that I added it to my Wealthy Formula. The goal of investing is so that you can build up $X of money. And we think that, without investing at a Y% rate of return, we are missing out on a lot of returns by selecting the wrong financial assets. At the start, most people have a simple target of building $100,000 of wealth. How long do we need to accumulate $100,000 with different financial assets? 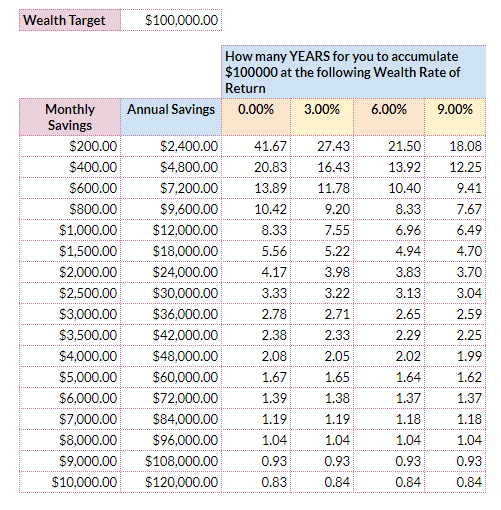 If you set aside $200/mth, if you put in savings that yield close to 0%, it will take you 41 years. If you put in stocks, you cut it down to 21.5 years. What if you set aside $1000/mth or $12,000/yr? Notice the difference between putting it in a financial asset yielding 0% and putting in something yielding 9% is a matter of only 2 years. If you increase the amount set aside to $24,000/yr, it makes even less of a difference. It takes you either 3.7 years or 4.1 years. Now what if the target is $300,000? Many people contribute $200/mth to purchase an insurance savings plan hoping it amounts to something. An insurance endowment probably yields you 3% and from the table, it will take you 52 years to accumulate $300,000. That is almost more than a person’s working years, and $300,000 is definitely not enough in 50 years time for your retirement! When you put away $12,000/yr, the difference between 0% rate of return and 9% is 12 years. This is still a big gap. But if you put it in something that yields 3%, the gap becomes 6 years instead of 12 years. Insurance savings plans, government bonds gives you close to that 3% returns and allows you to sleep soundly at night. If you are able to put away $24,000/yr, the difference between 0% rate of return and 9% rate of return is 4 years. The difference between 3% and 9% is 2 years. Beyond that, the difference due to rate of return is even smaller. In my wealthy formula, I showed that increasing the gap between income and expenses allows you to have more to set aside to build wealth. It would be much better to be conscientious in developing your career, optimize your expenses well then going gangbusters in your investment. Getting your priorities right and executing well can create immense wealth at the start. At the same time, your wealth would have accumulate to such a size that your returns would matter A LOT. I explained the impact of your competency in wealth building in an older article, asking you to be smart about it. 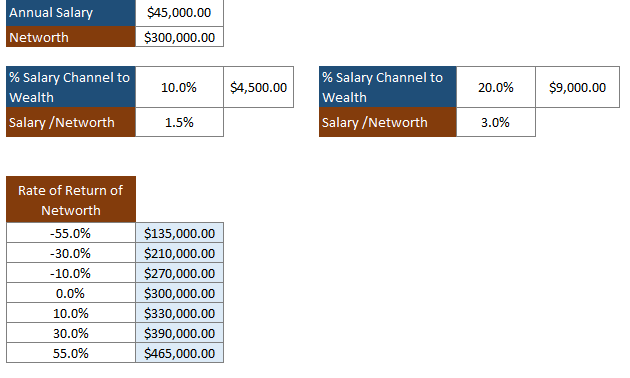 If your net worth has accumulate to $300,000, saving 10% of a $4500/mth salary or 20% of a $9000/mth salary is just 1.5% or 3% of your net worth. Annually it is just 1.8% or 7% of your net worth. However, if you are poor in your wealth building competency, and dabble in wealth destructive investing methods, your $300,000 can become $210,000 or a $90,000 loss! The ironic thing is that you cannot wait until you need investing to learn investing. It is damn difficult to learn what is required to reach a sufficient competency to build wealth wisely in a short span. This is why we 40 year olds turn to $3000 to $5000 investing courses, in the hopes for us to make up for the time we didn’t build up these wealth building knowledge. You cannot master investing well overnight, or in a short span. It requires a consistent time and effort in building up a workable way to invest. If you invest in a portion of your weekly time doing that, all these effort compounds so that you do not need to excessively spurge on these courses. 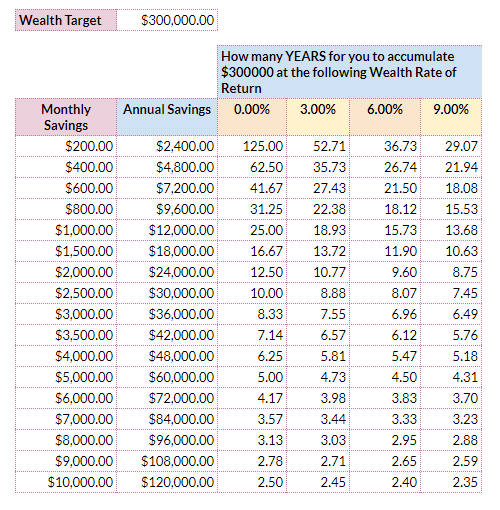 The tables of how long it takes for you to accumulate $100,000 and $300,000 illustrate that if you commit more to growing wealth machine(s), the rate of return you garnered (whether its 3%/yr, 6%/yr, 9%/yr) initially is less important. Given this, it makes more sense to focus on learning in depth the way you wish to build wealth. This can be trading, active stock investing, passive index investing, or plainly buying whole life insurance. 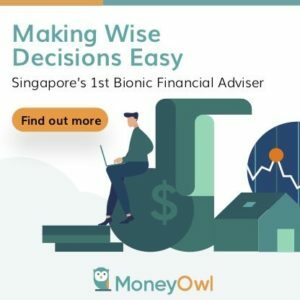 Going deeper into investing allows you to appreciate what are the nuances that make you a successful wealth builder, prevent potential mistakes. Unfortunately, not many people go in depth. They are so impatient to just do something. If you are putting away $1000/mth, or $2000/mth, don’t be so impatient to jump in immediately. You can automatically transfer this $1000, $2000 into a bank account (Bank Account 2 above) ring fenced to build your wealth machine(s). In the mean time commit to learn about building wealth well. Your wealth will grow at 0%, but you understand that a large determinant of your success is funneling enough into your Wealth Fund. When you build up $20,000, $30,000, you can then deploy $5000 to get a good feel on active investing, robo advisors, exchange traded funds. This reduced your risk against not knowing things well enough. You do not need to automatically funnel $500 every month into a financial asset. You can accumulate in a bank account and deploy when you are more comfortable. What lessons do you learn from deconstructing your child hood relationship with money, or in your experience teaching your kids about money? Do share with us. This article makes me very relieved. I started late in investing… about 5 years ago and am 35 now. I had accumulated some little ETFs and blue chips before SCB charges changed and I learnt about SRS. Now due to the high market, I am saving about 30% of income every month and feeling sh**tty about leaving it to “rot” in the bank. Thank you for your article. So my thinking and strategy has changed. Keep on accumulating the savings in warchest (I have 8 months of expenses in emergency fund), transfer them to SRS to buy some REITs and STI ETFs when the price is good. My only beef is the high brokerage cost but I guess that can’t be helped. This is for my retirement. I am for buy and hold, collecting dividends and reinvesting, not so much for active buying and selling. Does that sound okay? Hi WK, I think it is up to you to decide. You are trying to market time, to speculate based on this perceived expensive market. The article wishes to relate to people not to rush in, when they do not know enough. Keeping cash is also building wealth. I have no comments on market being expensive. by all indicators it can look pretty fair now.